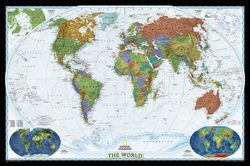 A classy political world map, by National Geographic, called "The Decorator" has solid fills for the countries, and a pale blue cover for ocean areas. A contrasting dark black border makes this world map a striking wall display! Features the Winkel Tripel projection showing the round earth on a flat sheet of paper while trying to minimize distortion. 2 sizes: 46" x 30" and 70" x 48"